Betdaq are an Irish based online sports betting company that were initially founded by entrepreneur Dermot Desmond in September 2001. Since then, they have come a long way and now employ more 200 people and provide their customers with a solid platform to enjoy some of their favourite gambling activities, ranging from an online casino, sportsbook, virtual and lots more. In 2013, Betdaq were bought by popular name Ladbrokes for a cool £30million, whom then went on to secure a merger with Coral and established their name as the Ladbrokes Coral Group and earning them their spot as the largest retail bookies within the UK. Betdaq’s website has one of the most unique colour schemes out there, however it does work for them and the longer you live with it, the more you like it. They have chosen to build their purple headers on a predominately white background and black text and surprisingly enough, they have done a great job of keeping advertisements from cluttering up your page to a minimum. Starting off with Betdaqs’ logo which is located in the top left hand corner of their homepage, just below this is the main navigation menu you will be using to manoeuvre round their site. Here you will find options to switch between their Exchange, Multiples, Casino, Virtuals, Sports Pools, Mobile, Promotions, Trading Pools and Betdaq Tips. Over on the right hand side of the page is where your customer bet slip is found and this will calculate any winnings you could potentially earn as you progressively add more bets to it. Underneath your bet slip is a small taster of some of the casino games available from that section and below that you will find some of their social media tweets and statuses and an array of top tips for upcoming horse races. On the left hand side of the page, descending downwards, is a couple of menus. The first one is a popular links section that will save you time if the sport or event you are looking for is likely to be one of the most regularly searched for, for that day or week. Underneath is a complete list of sports that you can find and bet on at Betdaq, which we will go into more details regarding below. Betdaq doesn’t provide the longest list of sports markets that customers can interact with and bet on, however, the sports they do include are covered to an acceptable level. So if you’re particularly interested in Football, Tennis, Cricket, Virtual Sports, Politics, Special Bets, GAA, Aussie Rules, Boxing, Baseball, Formula 1, American Football, Basketball, Rugby League, Darts, Rugby Union, Ice Hockey, Snooker, Golf, Greyhounds and Horse Racing, Betdaq definitely have got your back. As far as betting markets go, once you have selected the sport you are interested in, you will then be presented with a list of different leagues, competitions and events relating to that sport that you can choose from. These are listed in alphabetical order and are easily searchable via the country. Once you have picked the game you are looking for you will be provided an interface that shows you all of the available bets and football, for example, has markets ranging from Match Odds, Draw No Bet, Goals O/U, Correct Score, Half-Time/Full-Time, Total Goals, Both Teams to score, 1st/2nd Half Over/Under Goals. All new customers who sign up and create an account with Betdaq will be able to receive up to £1000 back in their first month. 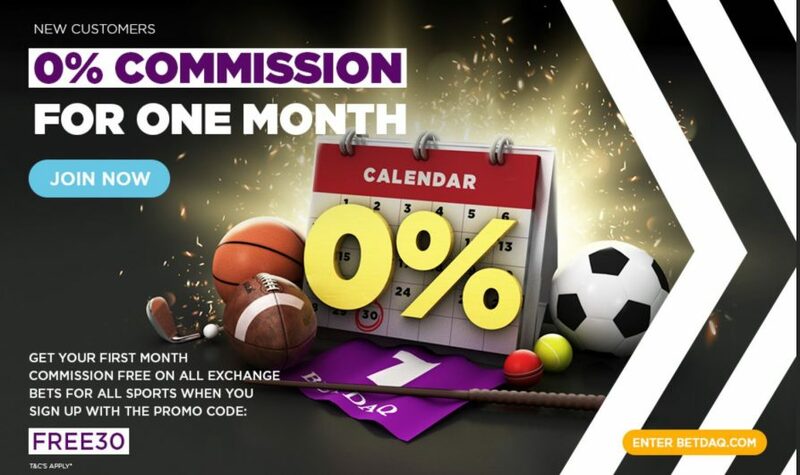 This works on the standard rate of 2% commission and if you’re a regular player, this is a great way of getting more value for your money. All customers can sink their teeth into the “Bet £10, Get £10” promotion. This is only valid on virtual markets, so to opt into this; make sure you enter the promo code “V1010”. If it’s accumulators that you’re after, you’ll be pleased to know that if you bet £100 between Monday and Thursday in any given week, Betdaq will reward you with a £10 free bet on multiples markets. By entering the promotional code “FOOT10” you will ensure your chance of receiving 10% of your Saturday winnings back as a free bet, up to £20 maximum. Something like this is nice to see especially if you are a regular at betting on the premier league or Saturday football, in general. Customers who enjoy betting at the most cutting edge points of sporting moments can rejoice at Betdaqs’ in-play betting console. The console is a fantastic addition to their site and is easily access and ready with a great amount of different sports. Customers can easily select between sport markets such as Football, Snooker, Cricket, Tennis, Baseball, Basketball and plenty more. Regarding betting markets, they have gone out of their way to provide as much as they can for the sports they cover and for football, especially, you will find markets like Match Odds, Draw No Bet, Asian Handicaps, Correct Score, Half-Time/Full-Time, Odd or Even, Total Goals and depending on which game you have selected can affect how many markets are available as the bigger matches tend to have more. Betdaq has a dedicated mobile application ready for their customers to download and enjoy everything that can be found on the desktop version of the site, but can be accessed from anywhere in the world and played from within the palm of your hands. Android users can find the app via google search or directly from Betdaqs’ website and IOS users can visit the Apple app store and download it from there. Customers have a great range of different methods in which they can credit their Betdaq account and also withdraw any potential winnings in the process. So if you are planning to use Visa, MasterCard, Visa Electron, PayPal, Neteller and Skrill, all of these are widely accepted here at Betdaq. Withdrawing your funds is incredibly easy yet the times can vary depending on which method you select. Cards take between 3 and 5 business days before the funds appear in your account and e-wallets take around 24 hours before you receive the money. The customer support provided by Betdaq is definitely delivered to a high standard and there are plenty of ways to get in touch with a member of the team. They have provided a contact number as well as an email address on the site, that you can use to reach them. However the best method of contact would be to use their live chat service which connects you to a member of staff within seconds. Sadly the live chat isn’t 24 hours and only operates between the hours of 10:00 – 20:00 Monday to Friday, 09:00 – 20:00 Saturdays and 10:00 – 18:00 on Sunday. Betdaq are one of the many companies who might be flying under the majority of punters radar, however those who use them are definitely aware of the benefits of doing so. They have a modest amount of sports markets for both regular betting and in-play with a fantastic range of different betting markets across the board. Their welcomes bonuses and customer support open times could be improved but are working fine as they are right now and it would only be something to look at in the future. So overall we definitely recommend you try out Betdaq to see for yourself and you can sign up and create your own account today by clicking below.